In an earlier post we discussed one of several reasons why companies tend to focus their hedges on short-term cash flows, leaving long-term cash flows unhedged. There we pointed out that the right response over the long-run to fluctuating prices and other risk factors, is changes in the operations and investments of the firm in order to re-maximize profits in light of the new competitive conditions. But there are several distinct reasons for the practice, and that was only one of them. Another reason why firms concentrate their financial hedges on short term cash flows has to do with uncertainty about the nature of the exposure at longer time horizons. Competitive exposures are very complicated, and involve many, many risk factors. We oftentimes focus on a single specific risk factor and quantify the exposure in very simplistic models. This is necessary if we are going to implement a financial hedge. For example, the airline needs to buy or sell futures contracts on a specific type of fuel delivered at a specific location on a specific date. To design that hedge we try to quantify the airline’s exposure measured in terms of the commodity represented by that specific fuel. But this focus on a single risk factor and exposure measured using recent data is only valid for very short horizons. The correlation between the futures price for that specific fuel and the airline’s actual cash flow may not hold at some distant date. All sorts of changes could undermine the validity of extrapolating that correlation. Some of these may be changes in the industry’s competitive dynamics, some may be in the types of fuels that are used by the airlines. For example, if bio-fuels gradually replace fossil-based fuels in jets, then the correlation between crude oil prices and the airline’s exposure will almost certainly change. The higher the uncertainty about the industry dynamics, the less a firm should commit to hedge, because it knows less how much it should hedge. And the essence of uncertainty is that it increases just with the length of time into the future. Prudence (i.e., sound risk management) indicates that it is not right to make commitments – either firm or contingent – when ignorance pervades. The International Energy Agency, OPEC and the International Energy Forum organized two days of meetings to discuss the interaction between financial and physical energy markets and the regulation of these markets — see the Financial Times’ coverage here and here. I was asked to speak on international coordination of regulation. Here are my slides. I took the chance to connect our argument that the costs to end-users depend upon whether increased clearing raises or lowers the aggregate credit risk. Both the physical and the financial markets for oil are global. If reforms are uncoordinated, there is the potential that the clearing system will be fragmented across national boundaries. This fragmentation could frustrate realizing the potential for reducing aggregate credit risk. People are often surprised at the short horizon of many corporate hedges. For example, airlines with disciplined hedging programs, only buy fuel forward for a short horizon. A typical hedging program locks in 100% of anticipated fuel purchases over only the next few months—possibly 3-6 months. Thereafter the hedge ratio declines sharply, so that the airline has no hedges for fuel purchases beyond 24 months or so. The airline is left fully exposed to long-term fuel price fluctuations. This fact contributes to the concentration of hedge trading in the shortest maturity futures contracts. There are multiple reasons why it makes sense for corporates to concentrate their hedging on short horizon exposures. One of the main reason is that the best way to respond to medium and longer horizon exposures is through active management of the firm’s business operations and adjustments in the firm’s investment program. Financial hedges are useful for covering short-run exposures when the company has little flexibility to adjust its operations and investments. A rise in fuel prices is a change in the real price of doing business. Operations and investments ought to respond to real prices. One way an airline can respond is to pass the higher cost along to the customer in the form of higher ticket prices. When that is possible, it isn’t even technically correct to say that the airline is exposed to the price of fuel oil, and it doesn’t make any sense for the airline to lock in the price of fuel. Of course, the cost cannot always be passed on. In the short horizon, there may be frictions that prevent the airline from adjusting ticket prices. For example, it may have already sold some tickets and committed to the price. At longer horizons these frictions aren’t relevant, but some consumers will be price sensitive and may cutback on their flying, limiting the airline’s ability to simply raise prices. This brings us to the second way that an airline can respond. If some customers are unwilling to pay the higher cost of flying, then the airline needs to adapt the profile of products it is offering. This may include changing its route structure, its mix of business and economy class seating, as well as the number of flights/seats on certain routes, and so on. Obviously these actions take time and cannot happen immediately. But over a longer horizon these should be the real focus of the airline’s decision making. Is GM’s Successful IPO a Vindication of Financial Engineering or Plain Old Engineering? General Motors sold more than $20 billion in stock yesterday, the largest IPO ever. The sale is a milestone in the US government’s takeover of GM and Chrysler. Of course, success has many parents, so there is a small debate about who and what is the cause for the, so far, success of the turnaround at GM. Steve Rattner is the private equity guy that Obama put at the head of the bailout. Rattner published his side of the story in a book that came out in September. Malcolm Gladwell, a staff writer for the New Yorker, has a review in the November 1 issue. Gladwell grudgingly concedes some credit to Rattner and his team, but then minimizes it, and ultimately takes his shots at Rattner. I doubt that Rattner ever thought of himself as a financial engineer. I don’t recall that term being used in the book. People have been doing restructurings for more than a century. On the other hand, financial engineering is about doing the same things that have been done for centuries, but with the advantage of the greater analytic tools and market instruments now available. So let’s call it financial engineering. My complaint is with Gladwell’s line that “at the end of the day, cleaning up a balance sheet is cleaning up a balance sheet” and with the desire to parcel credit on a competitive basis: more credit to the financial engineers means less credit to the guys designing the cars and managing operations. A company needs everyone on the team in order to succeed. No amount of financial engineering can create value where there isn’t a product or where there is an inefficient operation. But equally it is the case that a good product and efficient operation combined with a disastrous financial structure can produce failure. Gladwell’s instinct to pierce the puffed-up mystique surrounding private equity is a good instinct. Private equity specialists should be seen less as wizards or saviors, and more as mechanics. But Gladwell carries it too far when he refers to the “mythology of the business”, implying that the reputation is entirely fabricated. Private equity restructurings can help to create value. They’re just not the only ones who deserve credit for turnarounds. The good thing about credit is that giving some to the financial engineer doesn’t mean you can’t give some to the product engineer or the systems engineer. Nintendo’ management has decided to keep in US$ a significant fraction of its revenues from exports. Nintendo has a large $7.4 billion pile of cash held in foreign currencies (70% of Nintendo’s total cash reserves). See this Wall Street Journal article. With the sharp rise in the Yen since May 2010, after a crisis in the Eurozone erupted, and recently with the FED stimulating the economy with an aggressive monetary policy, Nintendo has accumulated large currency losses, when most of the other large currencies (Euro, Sterling and $) depreciated against the Yen. At first, one would say no. These are merely translation losses, and the competitive position of Nintendo (its ability to sell its products) is not affected by accounting losses. Moreover, Nintendo has expenses in foreign currency, so matching its revenues with operating costs in foreign currency makes sense. This is not entirely correct, however. Nintendo has over the past years aggressively shorted the yen to invested in other currencies, and taken advantage of higher yields abroad when compared with almost zero interest rates in Japan. This foreign currency strategy goes by the name of carry-trade, and has been massively employed by both Japanese companies and households since the late 1990s. It yielded very large gains until the eruption of the current financial crisis. Since then, investors and companies in Japan have used this strategy on and off depending on market conditions. The Japanese Yen, like the Swiss Franc, is a currency of refuge to investors when markets get nervous. In recent years, the correlation between different measures of market volatility (for example, the Vix and iTraxx) and the Yen has been pretty high. When investors become more risk averse and fearful they go long the Yen, and when markets calm down and volatility declines, the Yen tends to lose its value. The point is that a lot of companies and individuals use the Yen to express their fears about deteriorating economic and financial conditions. And there’s plenty of that nowadays. What this means is that, in addition to matching the currency in which its cash is held with the currency of its cash flows, Nintendo’s management has deliberately made a bet on currencies with the shareholders’ money. And recently, the bet has lost money, as in the past it has made money. This begs the following question: Should Nintendo’s management use shareholders’ money to bet on currencies, or should it let investors decide by themselves on currency betting? It is obvious that the majority of Japanese shareholders in Nintendo are upset with Nintendo’s currency losses, as they were presumably quite happy when Nintendo was making profits in the past from its portfolio of foreign currencies. But the management should not be surprised with shareholders’ reaction. Shareholders give the management discretion as to how retained earnings are invested, but voice their disapproval when management decisions go wrong. Betting on currencies is no different from any other investment decision. Except for the fact that Nintendo’s management has no business on betting on currencies. It’s hard to make a case that they have particular skills in doing that. The other part of the problem relates to executive compensation. More precisely, how currency betting is treated in compensating management. Often times, currency losses and gains are not treated symmetrically in managerial compensation. Because of this, the management might be inclined to take currency bets, if it can persuade shareholders that currency gains are the result of its talent, and therefore should be followed by unexpected higher bonuses, while at the same time currency losses are not penalized with lower bonuses. How the compensation is designed creates the incentives to act so as to maximize the chances of getting the targeted compensation. Moreover, executive compensation is not entirely outside of the management’s control, and can be subtly manipulated by managers. In general, managers are smart operators, and are able to focus the attention of shareholders on operating profits when (financial losses such as currency losses) occur, claiming that these are unpredictable, and therefore not their fault. Shifting shareholders’ attention on different results ex-post is a very common managerial tactic. The last two years has seen a dramatic decoupling of natural gas and oil prices. After prices for both commodities collapsed at year-end 2008, the price of oil recovered, but the price of natural gas has remained low. The ratio of the natural gas price to the oil price is at the lowest point in decades. Ironically, this has happened just as a string of academic papers had firmly established that the two price series move together–for example, here, here and here. The International Energy Agency’s 2009 World Energy Outlook reprinted a table from one of these papers showing how an increase in the price of oil would be mirrored over the subsequent 12 months by a matching increase in the price of natural gas. My colleague, David Ramberg, and I have just released a study attempting to make sense of these apparently contradictory facts. The bottom line: while a tie between the two series can be firmly established in a statistical sense, two features of this relationship have not gotten enough emphasis. First, there is an enormous amount of extra volatility in natural gas prices, so over short horizons like one or two years, the statistical tie between the two price series is very often swamped by extra swings in the natural gas price. Second, the level of the tie between the two prices — the normal ratio — is unstable over time, so that at longer horizons it is difficult to pin down the expected relationship. As the level of cash stockpiled by companies grows, so do the disputes between shareholders and management. The Financial Times reviews the positions being staked out by activist shareholders who want management to pay out more of that money. It’s no surprise that there are disagreements about whether the amount of cash held is too much. One attorney for activist shareholders is quoted saying that “There is concern that such high levels of cash may end up being used for less than optimal purposes.” What I found interesting in the article was the discussion of the macro determinants. The recent financial crisis undermined the ability of activists to fund acquisitions using debt, leaving management safer to build up their piles of cash. As the crisis subsides and debt financing becomes easier, the market for corporate control may be heating up. In this story, what determines how much cash companies accumulate isn’t the internal needs of the companies—not the ebb and flow of the need for cash, nor the ebb and flow of investment opportunities—but the external dynamics of the market for corporate control. This is in-line with the model of the takeover market being developed in a series of papers by Bart Lambrecht and Stewart Myers — see here and here. 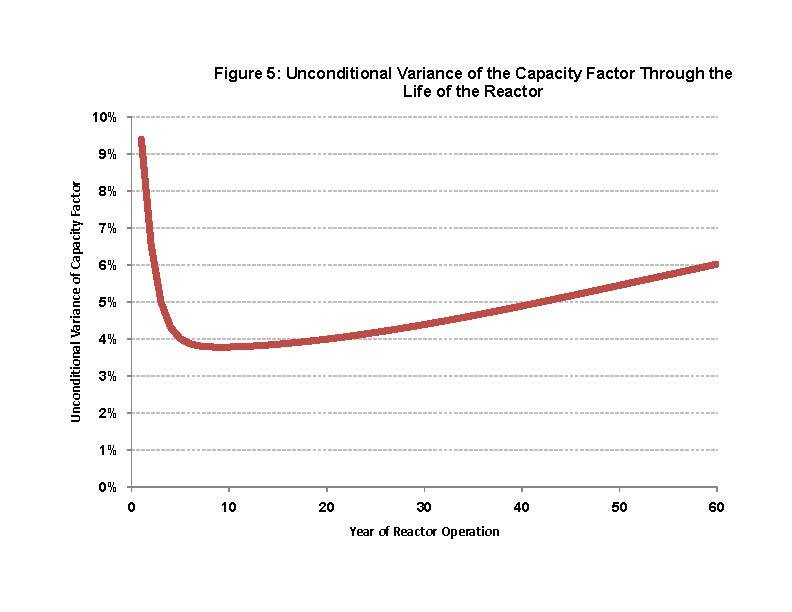 The risk is greatest when the reactor is just starting up. It then declines dramatically. Over time, however, due to the small, but cumulating possibility of a permanent shutdown it rises again. This is a nice demonstration of the fact that risks are not typically constant through time. The constant compounding of risk is a key assumption behind the usual discounting rule, but many people forget about this and just apply the rule to any and all problems, even when risks evolve in more complicated ways.